It can be heart breaking when you accept that those you love can no longer look after themselves and need to go in to a nursing or residential care home; and then finding a placement that you feel will give your loved one the care and support they need is a stressful challenge. This list of tips and advice from the CQC can help make those decisions easier for you. The Care Quality Commission (CQC) is the independent health and social care regulator in England. CQC inspect and rate all NHS services, care homes and home care agencies. After CQC have inspected a service, they produce a report. The report will include information about the safety of a service, how caring staff are, and how responsive a service is to your needs. The report will also include a rating of the service, Outstanding, Good, Requires Improvement or Inadequate. A recent CQC poll found that 92% of people believe choosing care for a loved one is life’s most stressful event – more stressful than getting divorced or buying a home. 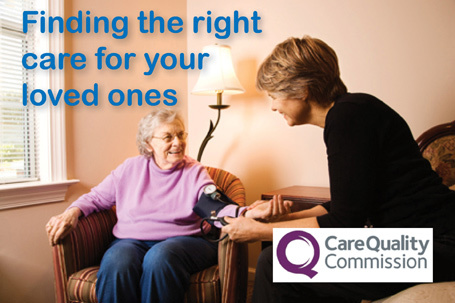 CQC have put together a list of tips and advice to help you make informed decisions about care. Many people avoid thinking about nursing or residential care until something unexpected happens and they have to make a decision in an emergency. This might mean that you don’t make the best choice. Start looking at care early and think about what is important so that you can agree a list of priorities. For instance, if you rely on public transit it will crucial to consider how accessible different locations are. What matters to you or your loved one? Armed with your list of priorities, check out the latest CQC reports and ratings of services in your area by searching CQC’s Care Home Ratings Map. Your local council may also have information that can help. Once you have a shortlist, make sure you visit and take a look around. Before the visit, prepare a list of questions you would like to ask so you don’t forget anything important. Make sure you have a chat with the manager – the way the care home or agency is run has a crucial impact on people’s lives. If you’re visiting a home, do ask the residents and their visitors to give you their honest opinion. Pay close attention to how staff treat residents, do they speak to them with dignity and respect? The best care homes support people to have a life, and are not just a service, so look for somewhere that does just that. How do they find out what people want to do and support them to take part in activities? There are many examples of care homes doing it well, such as Peregrine House in Whitby, where the programme includes films, afternoon tea, pampering sessions and Zumba. At Links Lodge in Blackpool, staff use iPads to create a stimulating and fulfilling environment for people with dementia. Once you have chosen a care service, its staff should ensure that you are safe and well cared for. They should be kind, have a caring, compassionate attitude and build a positive relationship both with you and your loved one. Your loved one’s individual preferences as well as their spiritual, ethnic, and cultural needs should always be respected by staff. If CQC finds that a home is not providing safe, high-quality care, they can take tough action so that improvements are made. They also want to know about good care, so that they can share best practice to encourage others to improve. If you have a loved one in care, you can feedback to CQC about your care experiences online or by calling 03000 616161. If you think that someone might be in danger, or that a crime has been committed, please do not hesitate to get in touch with the police.